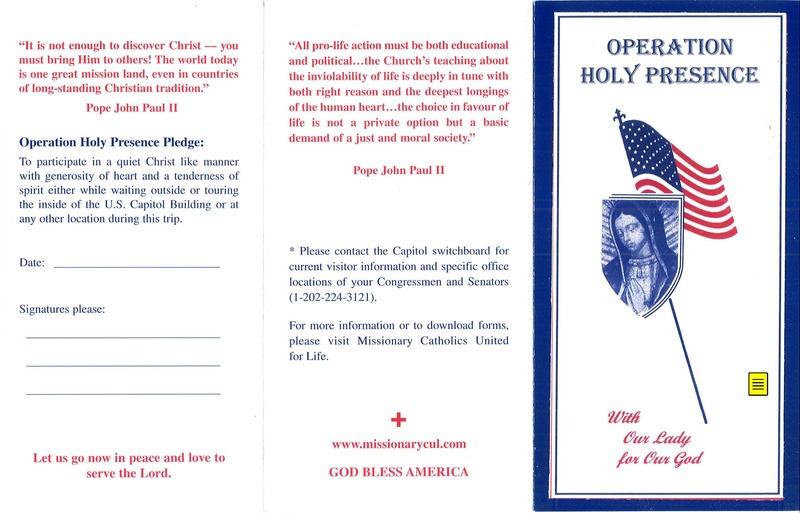 To participate in Operation Holy Presence, please print one form below for each person visiting their Representative and two Senators in Washington, D.C.
Action I: View the Operation Holy Presence form below. Please sign and fulfill the pledge to participate in a Christ like manner with generosity of heart and a tenderness of spirit either while waiting outside or touring the inside of the United States Capitol Building or at any other location during this trip. In addition to enjoying this historic city, the key purpose is to visit and deliver the signed pro-life petition to the office of your Representative and both Senators, even if they are not available that day. Action II: Please search to locate your Representative or Senators then sign the petition and deliver it to their offices on your trip to Washington D.C. U.S. citizens can go directly to the offices of their Representatives and Senators. Please, say yes to participate! We can make a difference with the signed petitions and a holy pro-life presence at our nation’s Capitol. In addition to taking part in Operation Holy Presence during the March for Life, please make plans to revisit the Capitol either individually or with a group again on another date. 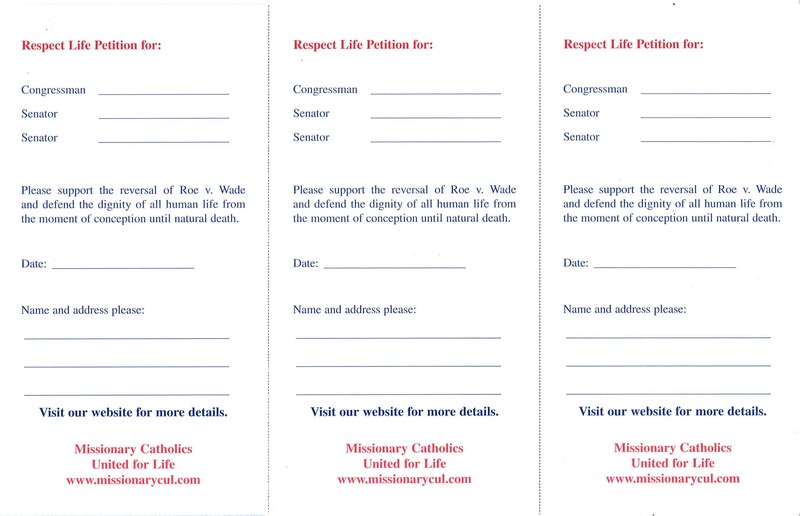 In doing so, this will provide for a vital and ongoing pro-life presence in Washington, D.C. along with the signed petitions for your elected officials to respect and defend the dignity of all human life from the moment of conception until natural death. We can make a difference. View Operation Holy Presence Form: side 1 and side 2. Print two sided tri-fold form. Fold, crease and detach petitions for delivery to your Representative and Senators. Enjoy your visit to Washington, D.C.